Home CryptoCurrency How To Buy Gold Using Bitcoin? Is Bitcoin money? Most have an opinion but no clear answer on this, and there is no reason to believe that this question will be settled in the near future. Gold has been the subject of many discussions in the last decades, but not in previous ones. Some accept Bitcoin as money, others have defined it as a commodity. However, this debate is very irrelevant because as long as you can purchase products and services using Bitcoin (especially Gold or Silver), it is in fact money. Bitcoin is an internationally recognised unit of account; this is one of its principal advantages. Bitcoin is similar to gold, they are both scarce, the Bitcoin system allows only 21 million Bitcoins to be mined. Similarly, gold mining increases the above ground supply by 2% a year. It is only natural that those who believe in the properties of Bitcoin are also attracted to Gold and other precious metals. 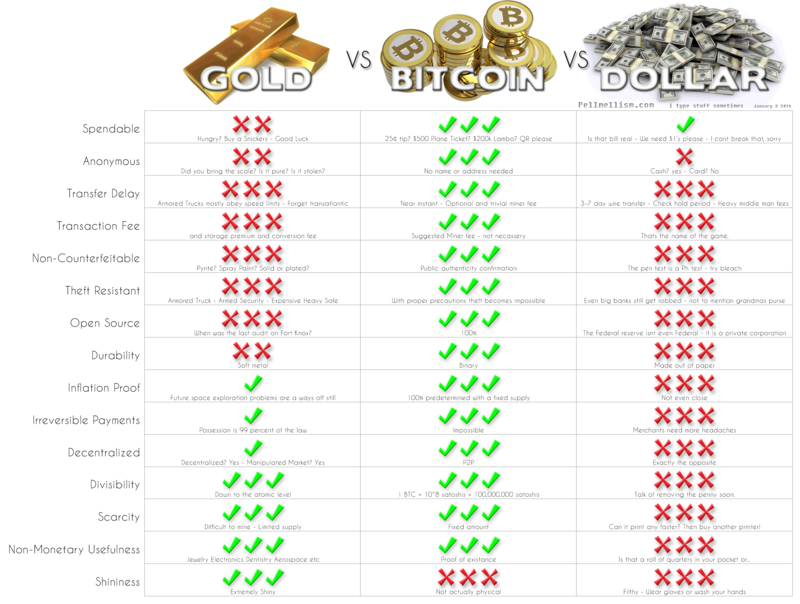 The difference between Bitcoin and Gold is fungibility or the equal treatment of each unit of Gold and each unit of Bitcoin. Some bitcoins can be marked as dirty and their value decreases, this is not the case of Gold. If you have significant amounts of Bitcoin and you would like to diversify, purchasing gold using Bitcoin makes sense. It would be economically inefficient to change your Bitcoins to USD or EUR and then use those dollars to buy gold. Bitcoin travels faster than Bank transfers; you can buy gold far more quickly if your options are either Bitcoin or a bank transfer. Some countries did establish capital controls, announced bank holidays and limited withdrawals from ATMs in times of financial crisis. It is in times like these when people seek gold or Bitcoin as a safe-haven asset. If you are locked out of your bank account, you certainly cannot buy gold. However owning Bitcoin on an a foreign server, will allow you to access the safe haven of gold. This is absolutely very general information make sure to check your local legislation and laws regarding this matter. Bitcoin and gold are different, but they can complement each other. Bitcoin travels across electronic wires and people on different continents can transact using Bitcoin. Physical Gold cannot travel across electronic wires, but can act as a unit of exchange where there is no electricity, Bitcoin can also do this through off-chain transactions, but this can be done between parties that trust each other. Some nations considered Bitcoin as the money of criminals, unfortunately gold is being similarly categorised. This is a symptom of the war on cash. The truth is that Cash is the most anonymous medium of exchange that exist. Still the European Union recently has expressed its intention to register Bitcoin users on an international register. It wouldn’t come as a surprise if the European Union did the same to gold holders. Potentially if the narrative about Bitcoin and Gold continues to be negative you could find yourself in double trouble if you own both assets. This is pure speculation on my part, but it is based on facts. In some instances Bitcoin has been classified as a tokenized commodity, what this means in practice is that businesses using Bitcoin to transact, need to register as a money transacting businesses otherwise they can be the subject of the US financial crimes enforcement network and similarly from other national agencies. This is a list of vendors which at the time of writing (November 2016) accepted Bitcoin in exchange for gold. These links are not an endorsement to any of these businesses. I am not very familiar with any of the above providers however, I would be happy to receive feedback in the comment section or any of the above Gold sellers that accept Bitcoin. Down below you will find a detailed review of BullionStar a Gold seller which accept Bitcoin as a means of payment. You can buy gold, silver and platinum using Bitcoin. VaultGrams are allocated but unsegregated grammes of Gold, Silver or Platinum. The advantage of VaultGrams over other Bullion products is that they are cheaper to store. The gold purchased with Bitcoin can either be stored in a Bullion Star’s vault or delivered anywhere in the world. In 2014 precious metal sales from Bullionstar totalled 89.6m, a 69.1% increase from 2014. This shows a number of trust customers are putting in this Gold Seller. BullionStar also supports the US Dollar and the Euro. You can buy gold using Bitcoin store it in BullionStar Vault and then sell it for dollars or euros. Then you can withdraw that currency into a bank account. There are five different audit schemes which verify the contents of the vaults. Bureau Veritas is an LBMA recognised auditor, makes sure that everything is where it should be. BullionStar is not only a seller of gold, they have some distinguished analysts working for them, including Koos Jansen. Singapore is a safe country with strong property rights; crime is very low. Bullionstar is based in Singapore. There have been tensions between Malaysia and Singapore in the past, could such tensions come back and then spill over into conflict? There is a minimum storage fee of 19 cents a day. You can only store your precious metals in Singapore; other providers offer International storage locations. Buying gold and other precious metals using Bitcoin is a facility which is essential to the international and savvy crypto-investor. Choosing a service provider should be based on a strong track record of happy customers, efficient transactions and reasonable fees. BullionStar fits the above, go to their website to discover more of what they can offer: BullionStar. Next articleHow To Invest In Hardwood Trees? I an provide 1kg+ OF PHYSICAL GOLD purchased with B.C with a 20% discount. Buy 6 months in advance.